We offer a list of providers SAINT-HERBLAIN and around in the department Loire Atlantique of the region Pays de la Loire. If you want us to organize you for your seminar, please contact us. 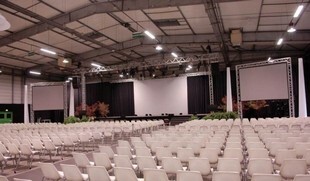 We can also arrange free to question the seminars places SAINT-HERBLAIN with our service SOS EVENTS. Ellipsis, with more than 30 years of experience in the event, technical, artistic, development, rental, installation and sales fields listens to you, accompanies you and advises you during the development of all your projects, whatever your objectives , to make your events a highlight. Zen Organization is an event agency that organizes since 2011 team building trends trends, original and personalized to federate your teams for your seminars. Auchan catering can accompany you for all your private and professional events: meals baptism or communion, Christmas Eve dinner or buffet supper appetizer, or just during an evening with friends. The Caudalies, gourmet restaurant near Nantes (Loire Atlantique, 44), welcomes you to Saint Herblain near Orvault. The chef offers home cooking with fresh products and our sommeliers a wine list with many references. Our event agency realizes more than 750 team building events and company evenings a year. We work for groups of 10 1000 people all over the great west.This made Zen Organization the leader of the Team Building in Nantes, Rennes and throughout the west of France.